Registration for Kappa Delta’s National Convention has reached capacity. Please visit this link to be added to the waiting list. We will reach out to you if registrants cancel and space becomes available. 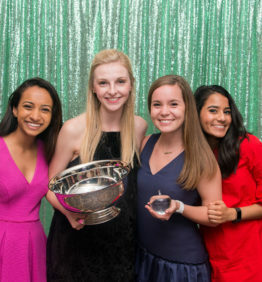 More than 1,000 KD sisters will gather this summer in Dallas to hear educational and inspiring presentations, celebrate the accomplishments of the sorority, its chapters and individual members, and meet sisters from across the country. Delegates will elect the 2019-2021 National Council and vote on proposed revised National Bylaws. National Convention begins with the Opening Session on Thursday, June 27, 2019, and concludes with the White Rose Banquet late evening on Sunday, June 30. The full-time registration fee includes all programming and the following meals: Thursday dinner; Friday lunch; Saturday lunch and dinner; and Sunday lunch and dinner. The registration fee does not include travel or hotel stay. Part-time registration is also available and varies per meal/session. Those costs are provided in the registration form. The event will take place at the Sheraton Dallas. Visit this link to make hotel reservations online or call 214-922-8000. Let the hotel know you are with Kappa Delta to get the special convention rate, if available. Parking is available at the hotel for a cost. Those attendees serving as voting delegates for their collegiate or alumnae chapters will elect the six National Council officers who will lead our organization in the 2019-2021 biennium. You are encouraged to review the National Council officer job responsibilities and the slate prior to National Convention. Visit the National Elections page for details. If you have questions about the National Council elections, please contact Tyler Easterling, 2017-2019 Nominating Committee chairman, at KDNomCom@yahoo.com. Kappa Delta hereby gives notice that Convention delegates will vote on proposed revised National Bylaws at the 63rd Biennial National Convention in Dallas, Texas. We encourage you to view the proposed revised National Bylaws prior to Convention by logging into the Resource Library. Any proposed amendments to the proposed revised National Bylaws must be submitted to the National Bylaws Committee by June 1, 2019, for them to be raised by members on the floor. If you have questions about the bylaws process, please contact Jody Corry, National Bylaws Committee chairman, at nationalbylaws@kappadelta.org. There will be inspirational speakers, multiple breakout sessions related to personal and professional development and meaningful Kappa Delta Ritual throughout. This will be a truly historic National Convention as we welcome members of the next National Council. Attendees will have an afternoon free to hang out at the pool, visit with sisters from across the country and check out local attractions. There is something for everyone! Check out the agenda-at-a-glance. Plan to bring cocktail attire for Thursday night’s Diamond Dinner and Saturday’s Awards Dinner. You will need a formal dress for the White Rose Banquet on Sunday evening. Plan to wear pin attire for all breakout and general sessions. All voting delegates must wear a white dress or white pants/blouse along with white shoes to business sessions. If you are not a voting delegate, you do not have to wear white, but should wear appropriate pin attire. Also, a reminder that some rooms may be cold, so bring a sweater or light jacket. Visit our Pinterest page for ideas. 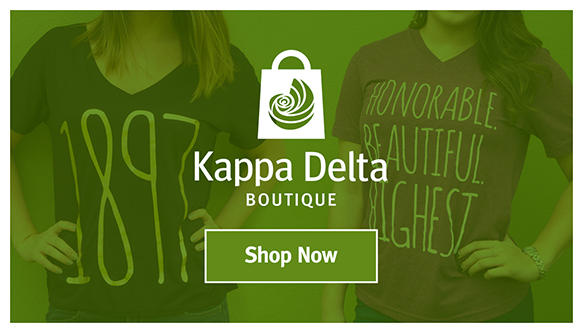 If you have questions, please email Events and Retail Coordinator Alison Hardison at alison.hardison@kappadelta.org.